The IET Digital Library is designed to provide quick access to research and engineering literature. You can start exploring the website now - for free. 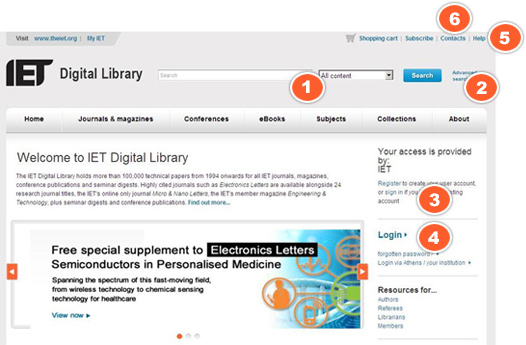 The IET Digital Library comprises of over 175,000 full text journals, magazines, conference articles and eBooks - including over 70,000 historical documents from the IET's archive, dating back to 1872. You don't need to log-in to explore the IET Digital Library, but if you want access to the full range of services – including setting up free email alerts, and saving and purchasing content – it is recommended. The Access Key symbols (next to the content) denote the level of access that users are entitled to.